During my recent journey to Japan which led me to the north of Honshu at the extreme south of Kyushu, I visited for the first time a lovely city deeply nestled among mountains covered with woods. This city is Kakunodate, located nearby Akita (I’m giving details for the people, like me, who enjoy poking their nose on a map and dream while pointing their finger on imaginary roads). In Kakunodate the tradition of wood work is still carried on. But not any wood ! Here they are only interested in cherry tree. Objects are carved in its bark, or, in other words, this beautiful bark is turned into a smooth and delicate leaf just like a precious parchment and is then pinned against the desired object: a tea canister for example. With the help of a small flat-iron, this worker smoothly presses against the bark, after having coasted its back so that it perfectly sticks to the tea canister’s body. 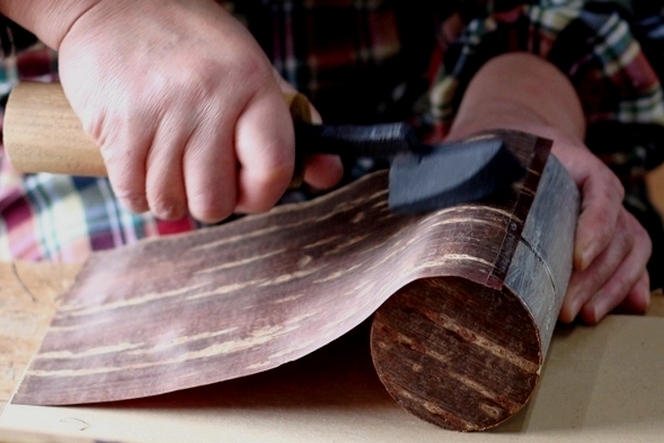 Of course, before that, she slowly polished the bark with great care, using the blade of a knife in a repetitive movement so as to make it surprisingly soft. I’m admiringly watching her, in the silence surrounding her workshop. Once the tea canister is finished, she strokes it and holds it out to me with a discreet pride and I’m thinking about the beautiful Japanese green tea which will be a perfect case for it.